HTML WYSIWYG Edit ActiveX Control for CMS and CRM designers. Features table editing, CSS support, customizable language localizatation. Inc. FTP class can upload images to a web server automatically or, can be used independently. HTML DOM branch status bar allows manipulation of tags, object properties and CSS classes of any HTML node. Compatible with any environment that supports ActiveX components such as VB6 , Microsoft Office 2000+ , VS.NET. 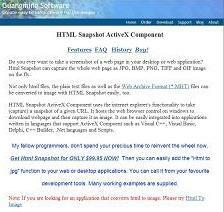 Easy-to-use ActiveX email component to effortlessly mail from ASP/ASP.NET web pages. Features logging to text file or ADODB, SMTP authentication, COM+ integration and a quick test facility to test the component without writing a single line of code. Messages can be sent in plain text, HTML or other MIME formats. Additional features include multiple attachments, recipients, CC recipients and BCC recipients. Flexible licensing options available. The Day View OCX is a list of items or appointments for a day which is like the Microsoft Outlook Day View displayed in the calendar. The Day View OCX allows the programmer to add, move and remove items, and define their appearance. Each item may have a title bar and icon, to differentiate between types of appointment. The appointments may dragged and stretched using the user interface. This free demo reads and decodes 1D barcodes from image files or in realtime from a webcam. It is intended to showcase the features of the EymBarcodeReader SDK, an ActiveX control capable of reading a plurality of barcode from image data. The SDK is available for licensing on a one-time fee basis (i.e. royalty free runtime distribution). For more information please visit www.metois.com. ASP/Verify is a server side COM component that helps web developers prevent automated registrations. (known as CAPTCHA? ).